When it comes to online classes, students want professors to know active discussion, accessibility and organization are priorities. Photo by Ryan Hyde and reused here with Creative Commons license. Online classes are to classrooms as the Kindle is to a physical book – convenient, readily accessible, but undeniably not the same. Doing classwork online isn’t new. Students are familiar with online discussion boards, taking quizzes on course management systems and filing articles for the Turnitin.com plagiarism check. Professors regularly upload lecture notes and give edits electronically. The list goes on. But entirely online courses are different. Interest in online education is growing: Investments made in education technology companies are at a record high in 2015 with $2.51 billion backing “instructional products directly involved in the learning process,” according to a white paper report from market research firm Ambient Insight. Screenshot of market research firm Ambient Insight’s look at investment trends in education technology. “We have seen a demand lately for basic journalism courses,” said Razvan Sibii, co-director of University of Massachusetts, Amherst’s online journalism certificate, of their 15-credit online program. Sibii, a lecturer at the university, also teaches courses in the program. Organizations like mediabistro.com, Poynter’s News University and Coursera, have tapped into this niche market teaching the next generation of journalists online. But at established higher education institutions, fully online journalism programs, like at UMass, are still unique and in constant development, Sibii said. As such, student feedback is always welcome, said Sarah Smith-Frigerio, senior academic adviser to the University of Missouri online master’s program in journalism. The “just Google it” generation of digital-native learners has spoken: online journalism and communication classes require a delicate balance of both Kindle and hardcopy. Here are five things students want their professors to know when teaching an online course. The notion that online classes are easier and less time-consuming is a commonly held misconception for students. There is something about being behind a computer and away from the classroom that is a hotbed for distraction, Kelsey Sorenson, a University of Wisconsin-Madison graduate student who has taken online writing classes, said over Facebook message. Students are really good at using the internet for entertainment, Sibii said. As long as professors are upfront about their expectations, they get used to the shift. “Online is synonymous with having fun, and realizing that now you have to read for four hours and post … you have to spend online the time you spend in the classroom and then some,” Sibii said. “I want a course that makes sense and can be applied to my professional life and not just sit in a theoretical dream land,” Harrison Hove, a first-year University of Missouri online master’s student, said in an email. Instead of writing abstract papers, Hove said he rather discuss current trends to give him a “leg up” in the field. Because journalism, by nature, is a dynamic and changing field, Sibii said students ask for “relevant course material” often. “They don’t want some canned lecture about the inverted pyramid that isn’t relevant to the media environment now,” Sibii said. In this regard, being online gives professors and facilitators the ability to link to current events and new resources quickly and easily, Sibii said. For Gordon Severson, a television news reporter who has been taking online graduate courses through the University of Missouri since 2013, the online classes that work best are those with actively engaged professors. “Professors need to be involved in the class discussions online,” Severson said in an email. Active back-and-forth discussions gives an in-person feel to online classes and makes for more stimulating learning, Severson said. He has been impressed with how the online conversations are able to provide a great substitution for in-person communication. Sibii said students often look for professor involvement to close the physical gap between instructor and student. 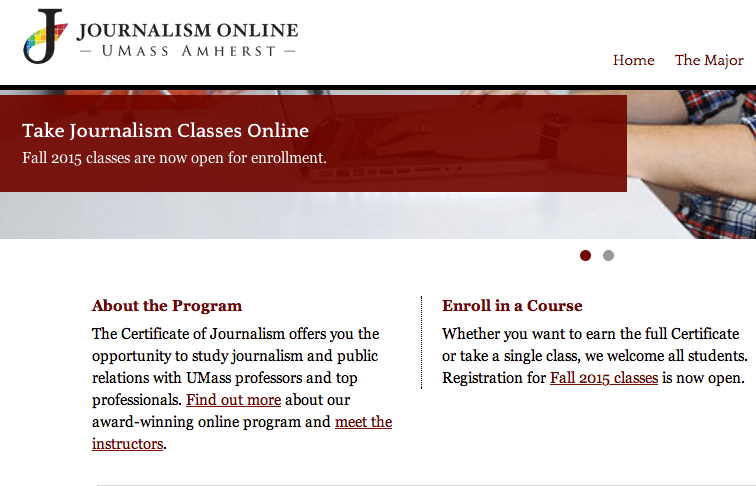 Screenshot of University of Massachusetts, Amherst’s website for their online journalism program, which offers a 15-credit online certificate. Michael Hoffman, a part-time journalism professor at California State University, Northridge, and Moorpark College and a graduate student in the University of Missouri online journalism program, had a group project with three other students in time zones spanning from the East Coast to Hawaii, he said in an email. Hoffman’s group made it work with discussion boards and email, but the reality that students can be all over the place reinforces the need for clarity in deadlines, Sibii said. “When you get a student complaint about a professor, it is most of the time ‘I wasn’t quite sure what they wanted and when they wanted it,’” Sibii said. Clarity is key, recent The New School graduate Azora Paknad said in a Facebook message. Paknad who has taken a range of courses both skill-based and theoretical found the most effective class was the most manageable and clearly organized. A Sunday deadline in Hong Kong, isn’t a Sunday deadline in Massachusetts, Sibii said. “What is missing is the synchronicity of sitting in the classroom together when the deadline is Sunday, and it is the same Sunday,” Sibii said. An ideal online class size for UW-Madison graduate Garth Beyer is small. Why? Because a common pitfall in online classes is the “one-off, first impression of work,” when professors don’t provide a back-and-forth on feedback, Beyer said. “[A] teacher doesn’t and can’t really care for so many students at once. It’s easier to give up and fall behind,” Beyer said in an email. Feedback and professor-student interaction are key, Sibii said – it has to do with students feeling their professors are lost somewhere across the Internet divide. Giving feedback can be challenging for professors, especially with larger classes, but in the absence of face-to-face interaction, it is a necessary alternative, Sibii said. 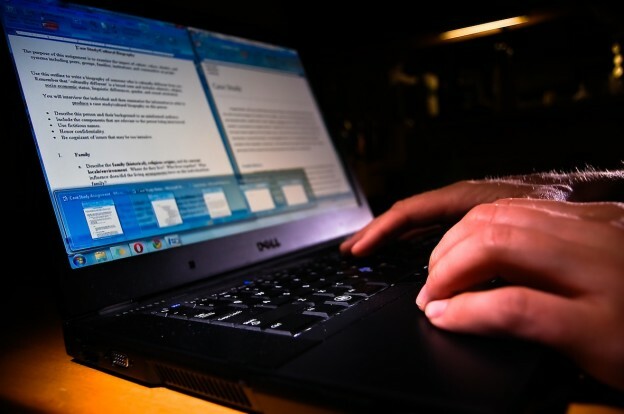 The “electronic touches” like an edited assignment, email or grade can help establish a connection with students and keep them involved in the class, Hoffman said in an email. Tara Golshan is reporting for the Wisconsin Center for Investigative Journalism in Madison, Wisconsin. She is a recent graduate of University of Wisconsin-Madison where she served as the editor in chief of The Badger Herald. Follow her on Twitter @t_golshan.